"Smoke 'em if you got 'em," drawled Tatoian Sensei, as he announced a short break between classes on Sunday morning at the Santa Rosa dojo. At this invitation, eight or so students arose from seiza, some ducking under the sliding door to the outside, some heading back into the dojo changing area, and the rest just relaxing and talking on the mat. Sensei's comment was probably something he'd said and heard a million times during his career in the Army, and it resonated with the simplicity and unaffected good humor that is one of the things I love about him. Tatoian Sensei, just back from the Phillipines to teach his first classes in Santa Rosa since January, had spent the first hour Sunday correcting and refining our 31 Kumijo partner practice. This form, a partner practice with the jo, is an attacker/defender form based on the 31 jo kata. Tatoian Sensei has had the benefit of a couple of visits from Hitohiro Saito Soke, and during these visits he picked up a few refinements. "He doesn't really teach me anything directly," Tatoian Sensei said about Saito Sensei, " but he will teach you guys, and I just have to pay attention when he does." The refinements we covered involved a change in the footwork and rhythm of the paired form during the sequence of moves from 9 to 12. The changes made the form more fluid and interactive in a martial way, as the transition from move 10, where the defender captures the attacker's strike and then enters with his own strike, is more of a continuation instead of discrete moves. It requires the attacker to go from offense to defense in a particular split-second. I trained this sequence with Jor, and we picked up the rhythm after a few halting trials. Sensei walked by us and said, "you two can do awase now." Telling us to shift into real-time fluid practice from the more halting stop-start routine we'd begun with was his signal that we were doing OK.
Tatoian Sensei looked great. He'd lost about 30 pounds, and he walked easily and lightly with no sign of the bad hip that gave him a limp most of last year. At one point he asked me to grab him so he could demonstrate Morote Dori Kokyu-Ho. It was like being lifted up by a steam shovel. I had so completely lost my footing, as he uprooted me, that I had to take a roll off behind him, rather than just crumpling under the finishing strike. To be so totally thrown is very exciting, and something I've missed since he'd gone away. As of now it looks like Tatoian Sensei will remain in Norther California through most of the Summer, returning to the Phillipines by September. In the meantime, he will probably teach at least some of the weekly classes at the Santa Rosa dojo, including a two-hour class on Sundays. 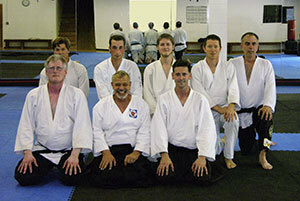 Above is a photo of all of us who attended Sunday's class.